The polar vortex is a persistent, large-scale atmospheric cyclone feature located near the Earth's poles. The vortex is most powerful in the hemisphere's winter, when the temperature gradient is steepest, and diminishes or can disappear in the summer. The Antarctic polar vortex is more pronounced and persistent than the Arctic one; this is because the distribution of land masses at high latitudes in the northern hemisphere contribute to the breakdown of the vortex, whereas in the southern hemisphere the vortex remains more undisturbed. The Arctic vortex is elongated in shape, with two centres, one roughly over Baffin Island in Canada and the other over northeast Siberia. Figure 1. Schematic of the polar vortex, courtesy of the Department of Earth and Environmental Sciences, Columbia University. Winter-time polar odd Nitrogen, NOX (NO + NO2), is produced at high altitudes in the thermosphere and the mesosphere. 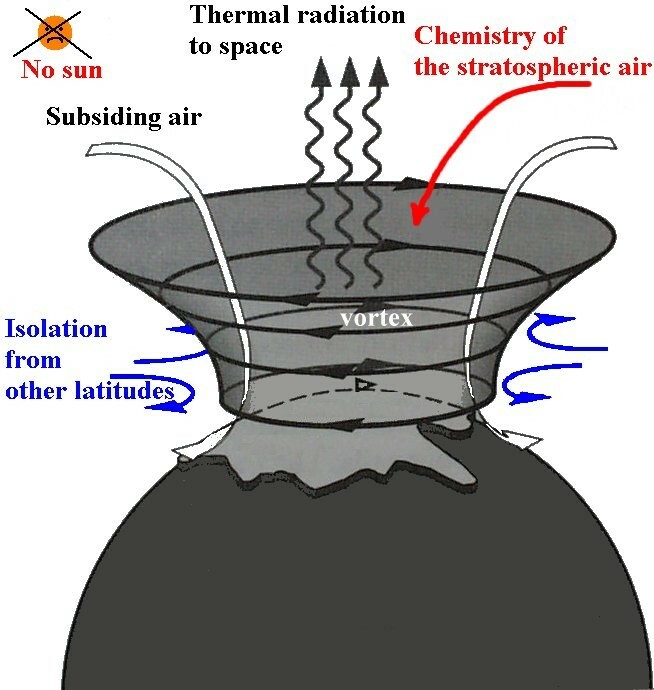 During periods of efficient vertical transport inside the polar vortex the NOX can descend to the stratosphere. In the upper mesosphere the NOX is mainly in the form of NO, as the NOX descends it is converted to NO2 [Solomon et al., 1982a]. NOX plays a key role in ozone balance of the middle atmosphere because it destroys odd oxygen (O+O3) through catalytic reactions [e.g., Brasseur and Solomon, 1986, pp. 291-299]. Hard energetic particle precipitation (EPP) into the mesosphere (that including a significant population of >100 keV electrons and >1 MeV protons), and softer EPP into the thermosphere (<100 keV electrons), generate in-situ enhancements in odd nitrogen. The mesospheric source is dominated by strong impulsive ionization episodes such as solar proton events [Verronen et al., 2005], while the thermospheric source is more continuous, being dominated by auroral ionization [Siskind, 2000]. During the polar winter odd nitrogen can survive, and in the presence of strong polar vortex conditions, descend into the stratosphere [Solomon et al., 1982a; Siskind, 2000]. During the northern polar winter of 2003-2004 these conditions existed; Randall et al. reported unprecedented levels of spring-time stratospheric NOX as a result. Rinsland et al. also observed very high NOX mixing ratios at 40-50 km in February/March 2004 with the ACE experiment, detecting levels as high as 1365 ppbv. Am example of satellite-observations of strong spring-time NO2 descent inside the Polar Vortex is shown in Figure 1. Although several powerful solar storms occurred at the beginning of the 2003-04 winter period (October and November) the main cause of the NOX was uncertain because of the breakup of the stratospheric vortex in late December 2003. Clilverd et al. [2006a] used radio wave data to show that the primary source altitude for the NOX was auroral zones in the thermosphere, and not a result of in situ production in the mesosphere. The descent of the NOX began a few days after the end of the stratospheric warming event at the end of December 2003. In that study it was unclear if the thermospheric reservoir of high-altitude NOX was generated by the large solar storms several months earlier, or by an accumulation of the effects of smaller storms as suggested by Siskind . Conversely, Renard et al. suggested that the source of descending NOX was from in-situ production at around 60 km caused by electrons of a few hundred keV, due to a geomagnetic storm that occurred on 22-25 January 2004. One of the few experimental techniques which can probe these ionization at these altitudes uses very low-frequency (VLF) electromagnetic radiation, trapped between the lower ionosphere and the Earth [Barr et al., 2000]. The nature of the received radio waves is largely determined by propagation between these boundaries [Cummer, 2000], termed "subionospheric propagation". Subionospheric VLF propagation allows remote sensing of the upper atmosphere over large regions; these signals can be received thousands of kilometers from the source, where ionospheric modifications lead to changes in the received amplitude and phase. Man-made VLF transmitters provide a well defined modeling situation, due to the known transmitter-receiver locations and fixed frequency operation, generally operating near constantly [Barr et al., 2000]. By using multiple VLF communication transmitters we have previously gained good understanding of the daytime lower ionosphere [Thomson, 1993] and variations during transient changes (e.g., solar flares [Thomson et al., 2005], low-medium energy electron precipitation [Rodger et al., 2005], and solar proton precipitation [Clilverd et al., 2005]). Subionospheric VLF radio wave propagation is sensitive to ionization located below about 90 km, including that produced by the ionization of NOX by Lyman-α [Solomon et al., 1982b]. The effect of increased ionization on the propagating signals can be seen as either an increase or decrease in signal amplitude or phase depending on the modal mixture of each signal observed. From the changes in ionospheric propagation conditions during the winter period we can determine the levels of mesospheric NOX either through in situ production or descent from the thermosphere. In a recent study we analyzed ground-based ionospheric data from mid-high latitudes during the northern polar winters of 2003-2004, 2004-05, and 2005-2006. The three years studied showed significant differences in solar activity, and stratospheric vortex strength, allowing us to study the interplay between these two parameters.